There is a hippo bull in the Sabi Sands Game Reserve, close to Kruger National Park, that has lost his wits. He spends his time in a small pond close to nowhere, without any social interaction with other hippos. Perhaps it is this loneliness that made him crazy. Or perhaps it is his craziness that caused him to be alone. Whichever way, he is an unusual and eccentric hippo. Every time a game drive vehicle drives past the little pond, he gets extremely excited, rolling in the water to reveal his pink belly, snorting and yawning. Because of his entertainment value, he has become the backup plan of many game rangers in the area – if they cannot find the Big 5, they can always show their guests the nutty hippo. Heinrich was introduced to this hippo while photographing for their book Kruger – Wildlife Icon of South Africa. One late afternoon the hippo was in a particularly snorty mood. The sun was setting and the light became golden and soft. Animals in the water always look better from water level, so Heinrich, under the supervision of the game ranger, got down to ground level next to the pond with his 600mm f4 supported on a bean bag. He locked the focus on the hippo and started shooting. He began with front lighting, but the light was becoming too flat and too warm for front lighting. 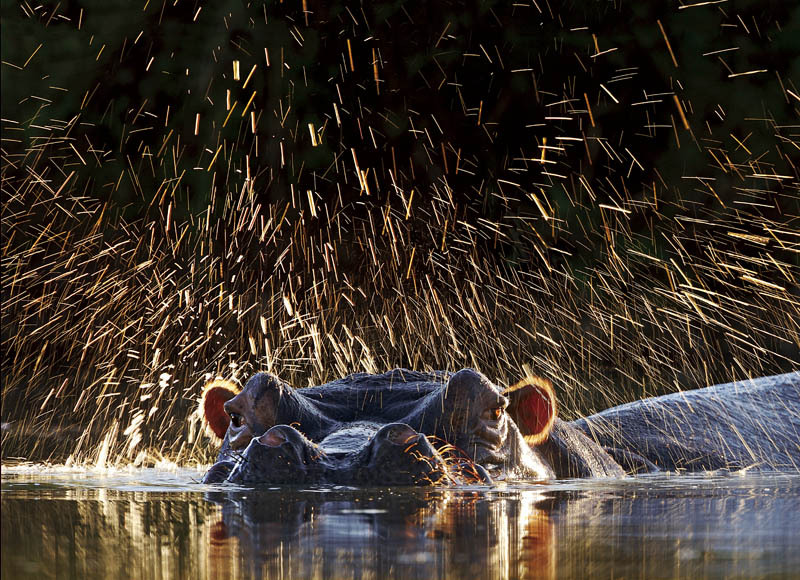 He tried side lighting, but the water drops didn’t show up enough on the images when the hippo snorted. So he decided to move to the far side of the pond, photographing almost directly into the sun to make use of backlighting to accentuate the spraying water as the animal snorted. He tried to use a fast shutter speed, but the water drops were just spots on the photograph and almost invisible. He dialled down the aperture to f16, so that his shutter speed was 1/30 second. This speed was perfect to blur the water drops just enough, so that they appeared as lines – almost a firework effect. He maintained the ISO at 100 to keep the image quality as high as possible. The sun disappeared behind the horizon, the hippo took one last roll in his pond, snorted and laughed. This time Heinrich was laughing too – he got the photograph. This, however, was not Heinrich’s last encounter with an insane hippo. The other hippo nearly cost him his life. Read more about it in a later volume of Phototips.